has a super great calendar for 2014. 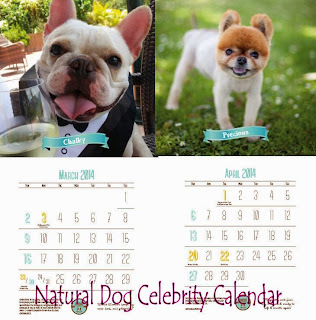 "The calendar is dedicated to the late great French Bulldog Benny. 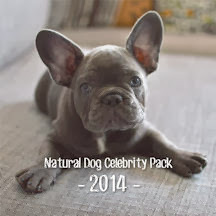 Not even cancer could darken this courageous Frenchie’s light heart. Shine on, Benny. 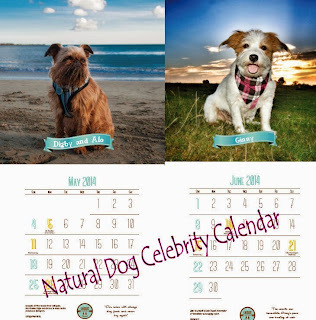 this is what they say..........."
"Our Natural Dog Celebrity Pack 2014 Calendar features many inspiring fuzzy faces but, first, let’s cover the basics. After all, you will use this calendar for an entire year so it’s gotta be durable and functional. Now, to those cute, funny, inspiring and silly fuzz faces! Each month features one member of the Natural Dog Celebrity Pack - Frenchies, Pugs, Jack Russell, Brussels Griffon, Pomeranian, and more! Celebrate the dog days of summer with Mr. July, Buddy the Love Pug (I dare you to not smile at a Pug in a bow tie). Give thanks with November’s suave Frenchie, Pierre Brando. " No Valentine this year? No problem! February’s Sumo and Buddha are far better than flowers and chocolate! A French Bulldog, wearing a pink Hello Kitty helmet while riding a Pink Princess scooter. Need I say more? 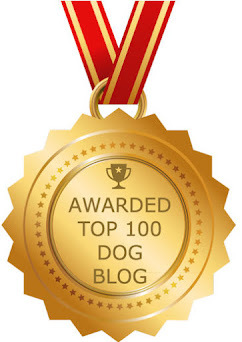 We also included Dog Holidays! 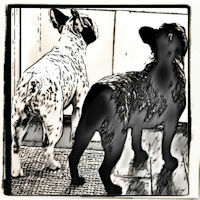 Is it just a coincidence that World Spay Day is right after all that Valentine’s Day love? 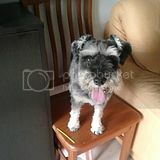 Who knows, but I much prefer celebrating World Puppy Day and Take Your Dog to Work Day over Columbus Day. As mentioned, 10% of proceeds will be donated to Short Mugs Rescue Squad and French Bulldog Village (so check “give more” off your resolution list)! These unspoken heroes rescue, rehabilitate and re-home French Bulldogs, Pugs and other dogs with short snouts. I am sure Benny is thrilled! Oh my dog, Lily...that is such a sweet thing they did putting you and brother Benny on the calendar! It's a great photo you two! 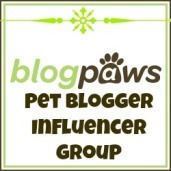 that was so very nice of them Lily, Benny touched a whole lot of peoples and furkids hearts that is for sure. Well how super cool is that......and look how adorable he looked. Love it. That was super kind. Nice one. Awww, we just got chills up our furry little arms. What a beautiful, wonderful tribute to Benny. This just touches our hearts and makes them smile. Wow is all I can say-what a wonderful tribute to Benny and his courageous spirit. That made my heart smile! 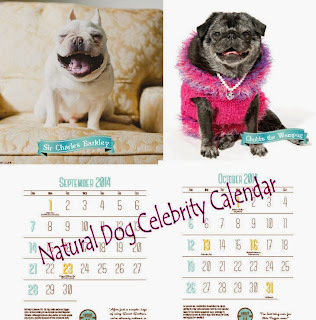 What a wonderful calendar and tribute to your Benny. Mom thinks she must have one of these! That was so kind of them to do that. I love that picture! That is just the sweetest thing EVER! Such a cute calendar. Pawsome tribute to Benny. What a great great calendar!!! Wonderful!!! Yes I'll bet Benny is smiling!!!! 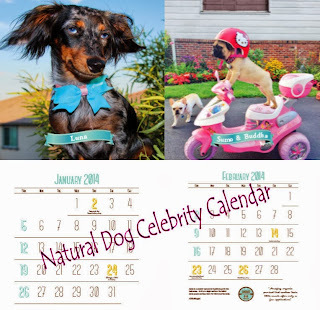 OMD...what a cutey patootie calendar!!! Shine on, Benny. You make us all proud. What a wonderful memory of Benny and a lovely quote too. Looks super adorable! I'm sure that calendar will sell out! 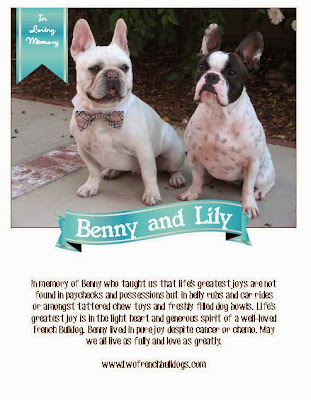 OMD Lily, we cried when we read their write-up about Benny. That was truly beautiful. We're gonna go check out the calendar right now. Lily that is just FABULOUS. We think Benny would be Thrilled with such a FINE tribute to HIM..
Wow, Lily, that's so wonderful! What a sweet memory of our beloved Benny. Benny was a delight for us all with his smile and willingness to do almost anything for a giggle. That is so special and I am definitely checking it out!!! Benn;y was so special and it is nice to have this beautiful memory of him.